Lock in a great price for Aloft Abu Dhabi – rated 8.2 by recent guests! Staff.. Especially Mark at front office was really good and Samuel at Mai restaurant. All staff are very friendly and exchange a warm smile and friendly yet professional greeting. The reception area is vibrant with a lot of energy. Pool tables at reception are a great addition. Plus a big thanks for installing bidet faucet in washroom. The staff Miro gave us late check out at 3pm and that was excellent service. As we checked in at 9pm. The pool and the bar next to it was really nice specially at night. The room is very comfortable. -The view is nice as it was facing the water side . - very convenient to the Exhibition centre entry Indoor access . I loved how friendly the staff were, they made me feel like I was home. The interior of the hotel is absolutely wonderful as well. The staff was excellent. Very nice pool. The coffee machine at breakfast was wonderful. Clean, quiet and very centrally located. Aloft Abu Dhabi This rating is a reflection of how the property compares to the industry standard when it comes to price, facilities and services available. It's based on a self-evaluation by the property. Use this rating to help choose your stay! 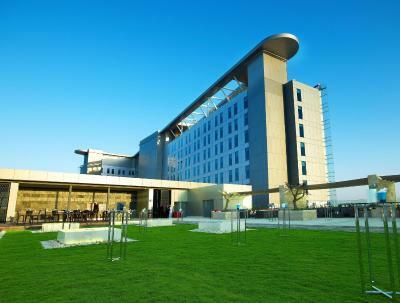 With its spacious rooms and outdoor infinity pool, the Aloft Abu Dhabi offers tranquility and comfort. The hotel is connected to the renowned Abu Dhabi National Exhibition Center (ADNEC) and caters to business and leisure guests. Accessing ADNEC is an easy walk through air-conditioned halls; which makes it ideal for exhibitors and events/conference guests. All 408 spacious and contemporary loft-inspired rooms and suites feature Ultra-Comfy signature beds, oversize spa showers, plug & play connectivity stations to link all your electronics to our 42" LCD TV and custom amenities by Bliss® Spa. Guests can also enjoy the Splash Pool and Maï Cafe Restaurant or just chill out sipping a cocktail while enjoying the panoramic view of the Abu Dhabi skyline at the rooftop bar- Relax@12. Other indoor facilities at the Aloft Abu Dhabi include a Gym, Billiards and Table soccer. Guests can also enjoy shopping experiences at convenient departmental stores just within walking distance from the hotel. Abu Dhabi International Airport is a quick 12 mi drive from the hotel and guests can pre-check luggage in at the airport counter located at the basement of the hotel. When would you like to stay at Aloft Abu Dhabi? This double room features air conditioning, view and seating area. This double room features air conditioning, flat-screen TV and seating area. This double room features a sofa, cable TV and air conditioning. This double room has a flat-screen TV, air conditioning and sofa. 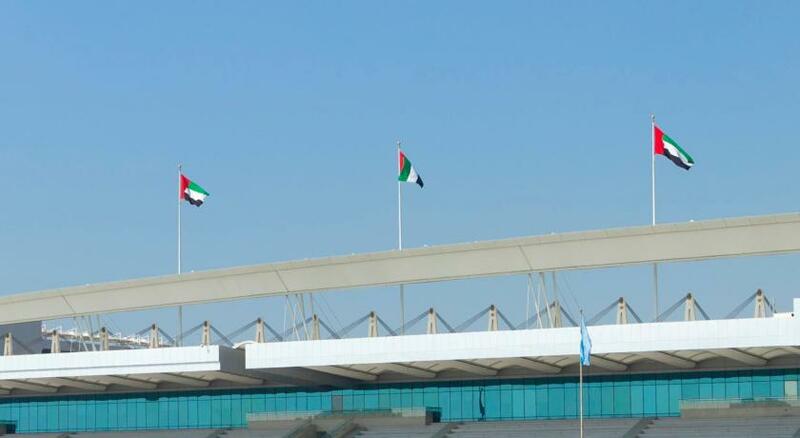 House Rules Aloft Abu Dhabi takes special requests – add in the next step! Aloft Abu Dhabi accepts these cards and reserves the right to temporarily hold an amount prior to arrival. As per local legislation, all guests are required to present a valid passport or state-issued ID at check-in. The hotel will not admit unaccompanied minors below 18 years old. Guests will also be required to present the credit card used for this reservation upon check-in at the hotel; If booking on behalf of someone else, kindly contact the hotel directly to arrange third party billing. All reservations made without a credit card or with invalid credit cards may be canceled by 18:00 on the day of arrival, kindly reach the hotel for arrival time. Due to a major exhibition taking place in the precinct, the hotel main entrance and parking service will be shifted to Car PARKING A (1st floor). All the vehicles in the outdoor parking area will be also moved to Card Park A. No one is available in the main entrance of the hotel to assist u wih laguage and for the prking they refuse to park my car and i have to do that by my self and i was about to go out from the hotel i been ask to pau for parking since no one inform me that i have to stamp the prking ticket wich i got from the machine or i need to show the key room wich is surprising me ??? customer service can be improved.